Many of our traditional recipes are rich in nutrition and are much tastier, healthier and comfortable to tummies. But these days, anyone hardly has any time to prepare a good meal at home. The more you start relying on fast food chains, packed meals, tinned foods- your health is at stake. Its always better to cook a meal once a day atleast to give some rest to your tummies. I hardly encourage my family to eat out and make most of the food at home. There are very less instances when we eat out and its confided to only special occasions or times when am not well or some other emergency situations.The reason being very simple, you hardly know the date of expiry of these food items, there are no ways to know the secret ingredients that they add to make the food more tastier and you never know the oil that they have been cooking is being used for days. I wouldn't say cooking all meals at home will make sure that you are eating all right things but to some extent we definitely know the ingredients that we add in our dishes. Today's recipe is something very quick to put together and can make a yummy one pot meal at home. I usually make this for dinner as it hardly needs any sides and kids enjoy this a lot. I have been making this since long but never posted here as I always prepare it for dinner. Then the lighting is not so good and I always postpone and think will make it during day to capture some good pictures which never happened. Then finally decided to click pictures this last time when I made so that its up here on blog. 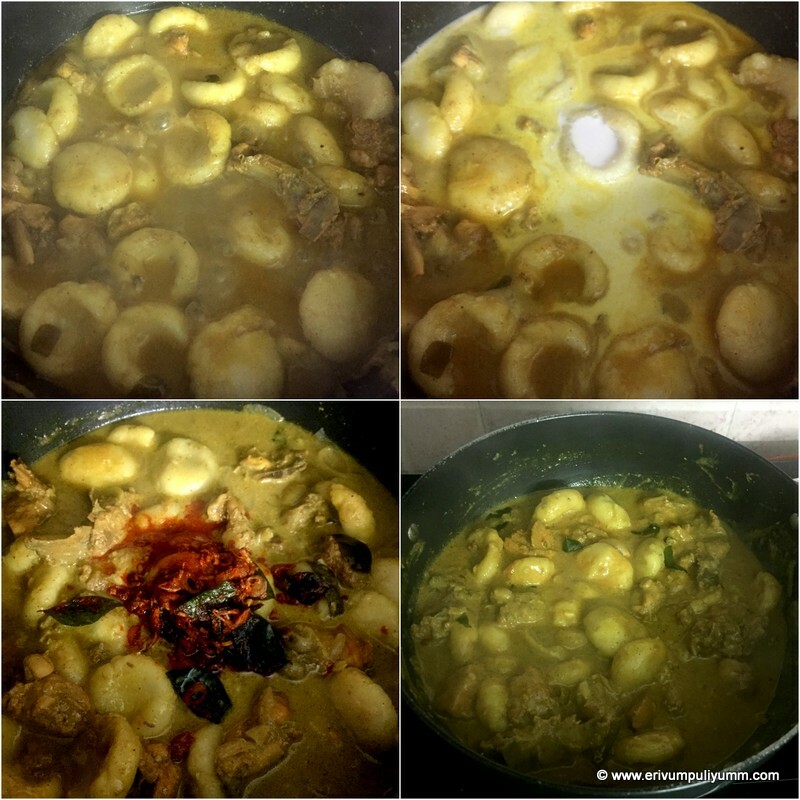 Kozhi pidi is a Malabar delicacy and pidiyum kozhiyum is a traditional Christian style recipe. 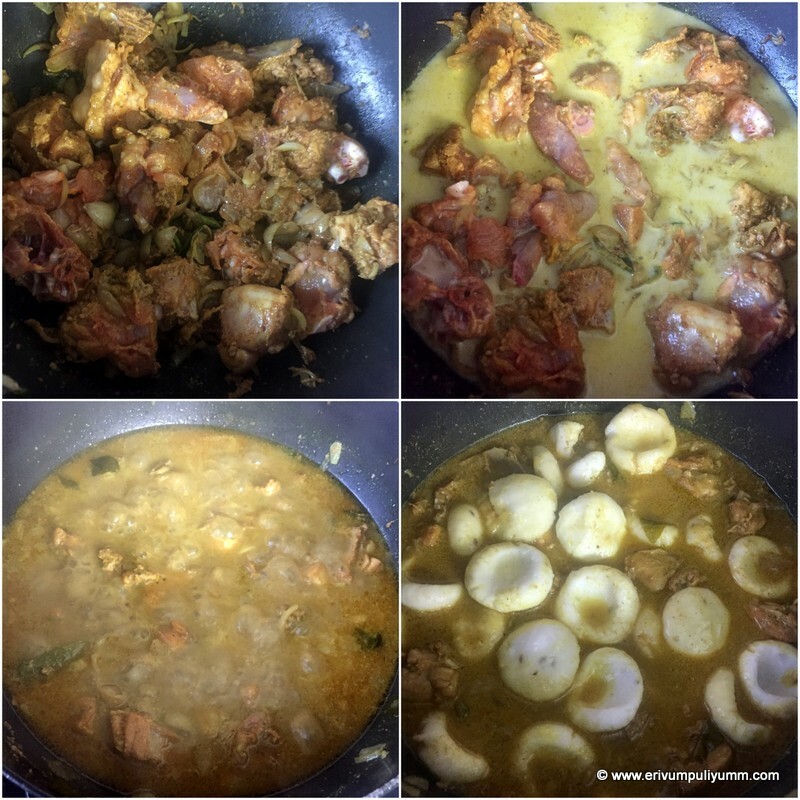 'Kozhi means chicken and 'pidi ' means rice dumplings; rice dumplings are mixed with chicken curry made with coconut milk. I happened to watch this long back in one of the cookery shows and thought to give this a try. Kozhi Pidi and pidiyum- kozhiyum are similar but in the pidiyum kozhiyum the pidi and kozhi are served separately wheareas in kozhi pidi, both pidi and kozhi are mixed together and served. The Kozhi pidi is spiced with pepper powder and the gravy is thickened with coconut milk. The pidis can be shaped as balls or flat disc shapes. The flat disc shapes cooks easily. This is definitely a must try recipe for Keralites and am sure you will love it !! Marinate the cleaned chicken with chilly powder,turmeric powder and salt for an hour. Boil water in a pan to make pidis. Switch off flame once it reaches a rolling boil. Take rice flour, add salt,grated coconut, cumin seeds and mix well. 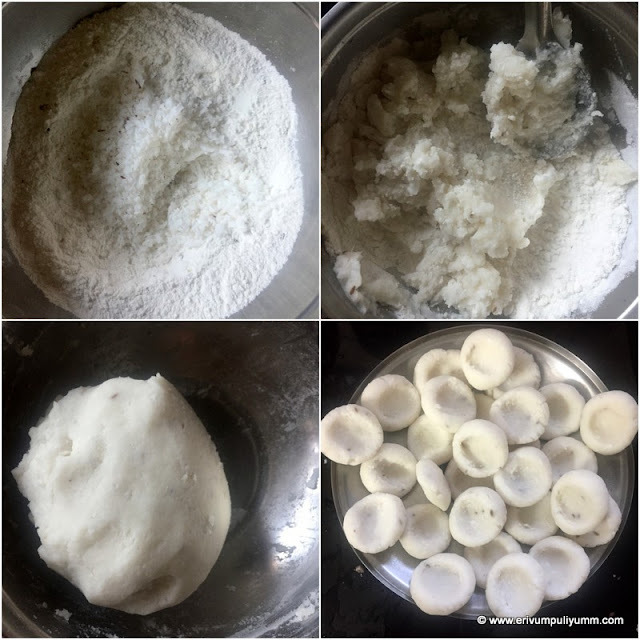 Add the boiled water an make a dough like for making idiyappam. Cover and keep aside. Heat a thick bottomed pan or use a clay pot(mann chatti) and add oil. 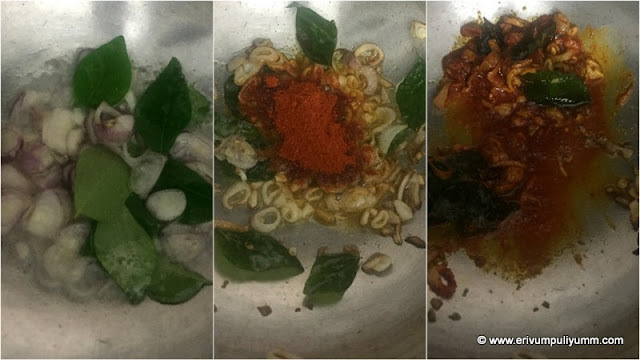 Add ginger garlic paste , Then fry the shallots, green chillies and curry leaves. Saute until the shallots turn golden brown and add powders(turmeric powder, salt, pepper powder, half of the garam masala) on low flame. Add the marinated chicken pieces,mix well and add second coconut milk(2 cups). Simmer and cook this for 15 minutes till chicken is 3/4 th cooked. If the gravy is thickened considerably, add in half cup water, add salt as needed. In the meantime, prepare the pidis. Scoop out small portions like gooseberry size. Make small balls and then flatten the center with thumb and place aside on a plate. Make all flat discs similarly till you finish the dough. Slide the made flat discs in the cooking chicken and give a quick stir, making sure not to break the pidis. Simmer again for 10 minutes to cook pidis and finally add in thick coconut milk(1/2 cup). Heat oil in another pan and add shallots. Fry till the shallots turns translucent to a light brown shade. Add in the curry leaves and chilly powder, switch off flame immediately. The residual heat is goo enough to warm the chilly powder, mix well and pour over the kozhi pidi. Keep covered for 3-4 minutes and then serve. 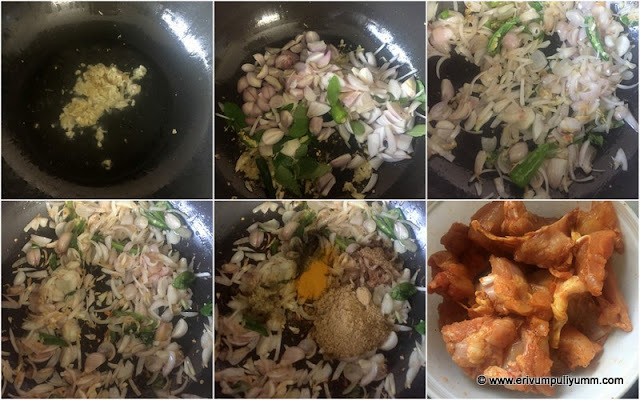 * Marinating the chicken is optional but marination helps the spices to seep in the chicken pieces. * Shallots add a special flavor to the gravy so try using shallots(kunju ulli). * The spice comes from the green chillies, pepper powder and chilli powder. Adjust as per tolerance. The coconut milk reduces the spices so add accordingly. * You can even steam cook the pidi separately in a steamer and add to the gravy when its almost done. However, I feel the pidis cooked in the gravy adds more flavor to the pidis. That curry sauce looks so good! Dear Julie. You know, I like cooking at home and if possible, I don't like to buy food. Your dish is delicious and its name sounds funny to me.